Incredible 12-Minute Cakes | Cook, Party, Enjoy! These cakes never ever seem to disapoint my host or their guests at my Pampered Chef Parties. They always turn out perfect and delicious. The best part of them is that they are so impressive and taste and look like they take so much more time. People are always amazed. Make these cakes in a microwave safe pan or mold. Try Pampered Chef Stoneware Fluted Pan or Silicone Crown Cake pan there are also glass and other silicone Bundt pans available at Target, Walmart, Amazon many of your favorite stores. 3 Easy to do Steps: Microwave, Plate and then just Garnish with icing, whipped topping, more pie fillings, nuts, sauces, etc. and serve. **If you want to use a conventional oven, you can also bake these cakes in the oven at 350 degrees F for 40-50 minutes. 3. Add cake mix and blend well with Mix ‘N Scraper. 4. 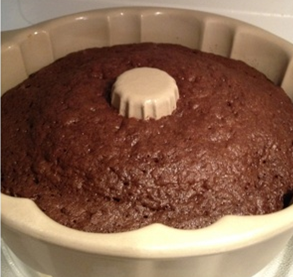 Pour batter into microwave safe Bundt type dish or silicone baking pan. Using 1/2 tub of prepared frosting, drop frosting evenly dispersing on top of the cake batter in the Bundt pan by the spoonful. 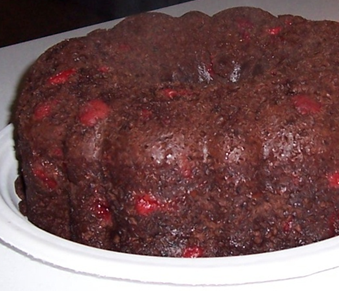 Microwave cake on high for 12 – 13 minutes. If your microwave does not have a turntable, rotate cake 1/4 turn every 3 minutes. Check with a cake tester and if not done, cook 1 minute more each time before testing again. 5. Let cool 10 minutes and invert on platter. Strawberry cake mix with chocolate frosting or spice cake mix with cream cheese frosting, or chocolate cake mix with coconut pecan frosting, the possibilities are fun to come up with and experiment. Find your favorite. Frosting will be on top of inverted cake. Garnish with chocolate chips, candies, nuts, whipped topping and/or fresh fruit. 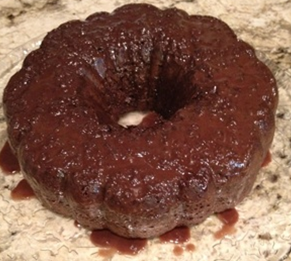 The best results are found with cake mixes containing puddings or the new moist cakes. Slice into this rich Chocolate Cherry Bundt cake in less than 15 minutes! 4. 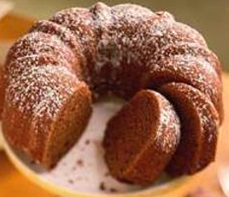 Pour batter into microwave safe Bundt type dish or silicone baking pan and microwave on high for 12 – 13 minutes. If your microwave does not have a turntable, rotate cake 1/4 turn every 3 minutes. Check with a cake tester and if not done, cook 1 minute more each time before testing again. 3. Add cake mix and cinnamon, blend well with Mix ‘N Scraper. Drizzle with caramel ice cream topping & top with cool whip! Try a sprinkle of cinnamon sugar on top. Top with whipped topping, grated chocolate and nuts. Glaze with powdered sugar glaze, chopped walnuts. Make it in stoneware. It always turns out perfectly. 3. Add chocolate chips to dry cake mix and toss to coat the chocolate chips so they won’t sink to the bottom while baking now add cake mix and chips to the wet ingredients and blend well with Mix ‘N Scraper. 3. Add white chocolate chips to dry cake mix and toss to coat the chocolate chips so they won’t sink to the bottom while baking now add cake mix and chips to the wet ingredients and blend well with Mix ‘N Scraper. 3. Add peanut butter chips to dry cake mix and toss to coat the chocolate chips so they won’t sink to the bottom while baking now add cake mix and chips to the wet ingredients and blend well with Mix ‘N Scraper. Drizzle with peanut butter glaze (3 tbs. peanut butter, 2 tbs. milk and 1 cup 10x sugar). hope you enjoy making these cakes. My family loves them and they are so easy to make. ← PESTO – WHO KNEW IT COULD BE SO GOOD?